Chic and elegant with a modern twist, this LED floor lamp offer energy efficient lighting to any room. A stylish choice for the living area or home office, this lamp features a chrome finish with durable and lightweight aluminum construction. The angled body and metal shade allow for precise light placement to illuminate your work space or to offer ambiance to a greater space. 50" high overall. Base is 9" diameter x 3/4" high. Round lamp head is 4" wide x 1" high. 623 lumens. 3000K color temperature. On-off line cord switch. 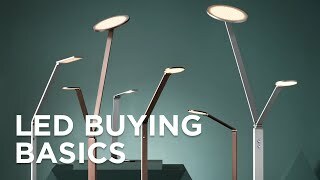 Mason energy-efficient contemporary LED floor lamp. Design by George Kovacs. My first lamp burned out after just a year and I then realized that the bulb couldn't be replaced. I had to throw the entire lamp away. Very wasteful. The item was replaced by Lamps Plus, but the second one burned out after 2 years and they wouldn't replace it. Only buy an LED lamp that has replacement bulbs. Hi Barb B., sorry to hear that your lamp went out. We do apologize if your item did not qualify for our full one-year warranty, but our customer service team would be happy to assist you with other solutions. Please reach out to them via phone, email, or chat. Thank you. With a stylish Brick Weave Gold Metallic patterned shadethis slim-profile floor lamp design offers a chic look for seating areas and more. With a stylish Harmonium patterned shadethis slim-profile floor lamp design offers a chic look for seating areas and more. With a stylish Labyrinth Gold Metallic patterned shadethis slim-profile floor lamp design offers a chic look for seating areas and more.